Дарина, Ania_i_Tania, Таня once again girls, thank you so much for your transcripts - they helped a lot. and big thanks to Вера and Ирина for videos! Thanks very much!dustman and evemhooper! Russian figure skating star Yevgeny Plushenko, who is currently competing at the European championships in Sheffield, England, said he might miss the world championships later this year because of injury problems.
" I was ready to withdraw from competing here in Sheffield because of health problems ," Plushenko, who won the European championship's qualification on Monday, told the press. The three-time world champion said he suffered a back injury on his arrival in Sheffield in addition to an ongoing knee injury. "There's a fifty-fifty chance that I will compete at this year's worlds, the 29-year-old skater said. "It's very hard to compete when you don't feel yourself completely healthy. That's why I want to undergo knee surgery once again as soon as possible. And nobody can say how much time I will need to recover completely after the operation. "I decided to compete only at one of this year's major events," he added. "And I hope I will be able to perform at the European championships here with dignity." 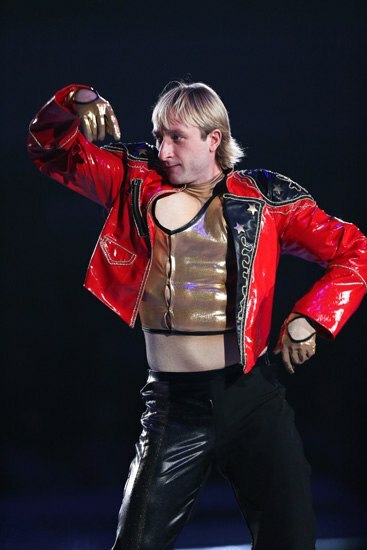 Plushenko, the 2006 Olympic and six-time European champion, has not competed in an international competition since taking silver at the 2010 Vancouver Games. However, he was the star attraction at Sheffield as he was looking to test his form for a possible challenge at the 2014 Olympics during the European figure skating championships which get under way on Monday. Plushenko, who is still hopeful of competing in his home Olympic Games in Sochi in 2014, enjoyed a winning return to the amateur ranks last month by claiming a ninth Russian figure skating title. The world figure skating championships will take place at Nice, France, at the end of March. I think his knee is apparently worse since RN.I am so worried about this. Before upcoming surgery on the meniscus a doctor asked me if a three years quarantee would be enough. I answered that I do not need three, even two would be enough. Mi La,you are wonderful ! Thank you for your many, fantastic and prompt translations in the forum. I am very grateful for you .Thank you all the girls to upload the videos and photos , it is great! Recorded by "东京彩虹"，uploaded by "普皇威武"
videos from Japanese Jsports 4, resolution 1440*1080 ,ts format,907MB. You can watch using "pot player". You can join it by hjsplit.exe. LunaMoon,you are wonderful.My friends are all very very happy to see this picture.Thank you very much! videos from Japanese Jsports 4, resolution 1440*1080 ,ts format,426MB. Some beautiful pictures about 2012 European Championships by "hellovitas" , who comes from our Chinese fan club. (maybe) Artistry on Ice announced on Chinese twitter that Zhenya will be in China from June 9-17. Any news Chinese girls? :plush32: Casts: Shen/Zhao, Plushy, Arakawa, Buttle, Alissa, Kurt, Johnny, others. confirmed casts by AoI on Chinese twitter ： Buttle, Alissa, Kurt, Johnny. Whether Plushenko will come or not is unknown yet. Also, Is that your baby on your avatar Simona? Alexei Mishin celebrated his birthday over the weekend (March, 10) with a special event, the Mishin's Cup in St. Petersburg. Mishin's Cup was a trial for former Russian champion Ksenia Makarova, who was attempting to prove to the Figure Skating Federation of Russia that she is ready to represent Russia at the Worlds later this month. The other skater who is being considered for the third spot for the Russian team, Russian junior silver medalist Polina Shelepen, had a disappointing short program placing sixth at the World Junior Championships. On the list of Worlds entrants posted by the ISU, Makarova is still listed as one of the three entries for Russia. The other two entries are Alena Leonova and Polina Korobeynikova. As of the third post, no further news has been reported by the federation about either Makarova or Shelepen. After April,17th ,12:30,all the viewers can buy tickets.